As promised, here is something from my ♥, to your ♥! CLICK HERE TO DOWNLOAD THIS TUTORIAL NOW!!! This tutorial is composed using 41(including coverpage) high-resolution pictures, all steps and procedures are zoomed and focus to deliver the precise instruction via a set of terrifically clear pictures. List of tools and materials used to achieve this composition is included in this document. The PDF is viewable the moment you click on the hyperlink, however Google Docs' PDF Viewer doesn't seem to display the document perfectly, the pictures were somehow truncated, you could click to download the document if you want (better pictures really), but that would require you to sign in. Please be informed that I don't want to know you are downloading, the required login was by Google Docs' design, for PDF attachment(s) as of today, I trust they will make this better in the future. Please note that this tutorial is a my share of tribute to the Wire Jewelry Making Community and it is strictly NOT FOR SALE. Please do not copy text, pictures, or any resources from within this tutorial, this tutorial is meant for PERSONAL USE ONLY. I appreciate any help in protecting me and my creations/designs/resources - please keep in mind that PLAGIARISM KILL CREATIVITY AND SHARING. So, have fun will ya? And if this little ring put a smile on your face or your daughter's face (I was told that little girls would love this! ), do drop me a line to make my day! Have a happy week ahead! Thank you so much! I will now try this for the first time. I have foolowed your work for a little time, but haven't deared do buy a tutoral yet, since it may be to difficult for me. Now I can find out:) Again, thank you!!!!! smykkeline - hope you have fun! Let me know how it goes! How nice of you to share your work like this. Your work is so beautiful -- it gives us something to strive for. Corra sweetie, you're the greatest, thank you for sharing this tutorial with us. You sure stay busy lady! Thank you for sharing, it's a great tutorial! 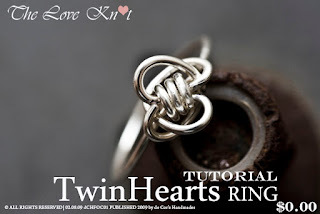 Thank you very much Corra, wonderful tutorial, I love it, your ring is lovely and beautiful, THANK YOU!!!!! Let's see if I can make it! Thanks! Corra! I look forward to having some time to try this one out! HUGS! Hi, Thank's for sharing this tutorial :). I look forward to having some time to try this one out :). Anyway sorry for the rant but what I was saying was I'm not sure if this is a stupid question but is it possible to make this ring in say like a size 4 3/4-5 1/2? And would it be hard to explain how to do it? If youcould give any advice that would be so helpful and awesome. Oh, one more thing. Thanks so much for the free tutorials! That's so awesome of you to help those of us just getting started to get some practice. And make cool stuff. Thank you.